First, some ramblings from the author. Oh! Hi there! If you’re someone who subscribes to this site, you’re probably surprised to see I’m posting here with some original content for the first time, in, oh, a good two years or so. If you’re someone stumbling across this blog for the first time, or rediscovering it after finally giving up on getting any new posts from me, welcome (back)! Chasing Amazing was launched more than six years ago as an intimate look at one person’s obsession with collecting Spider-Man comics and how he forged certain relationships and memories based on those comics. However, it quickly evolved into something more than that. 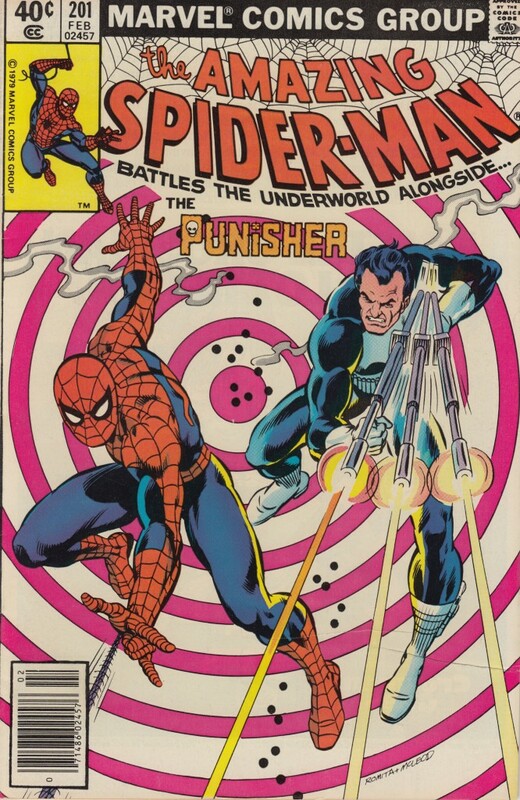 Beyond collecting, I also talked about new issues of Spider-Man (that were sorta, kinda reviews) and looked back on some favorite stories/arcs from yesteryear. That probably sounds like a perfectly sound (if not psychotically niche) fan site/blog. But it also became rather superfluous when, after launching the Superior Spider-Talk (now Amazing Spider-Talk) podcast in 2013, my co-host and good friend Dan Gvozden launched his own fan site, SuperiorSpiderTalk.com. Dan, being the smart guy that he is, gathered a team of writers together to post news, reviews, and anything else about Spider-Man you could think of. I got jealous watching his site grow while my army of one struggled to stay afloat, getting buried under a mountain of new releases and content from Marvel’s Spider-office. 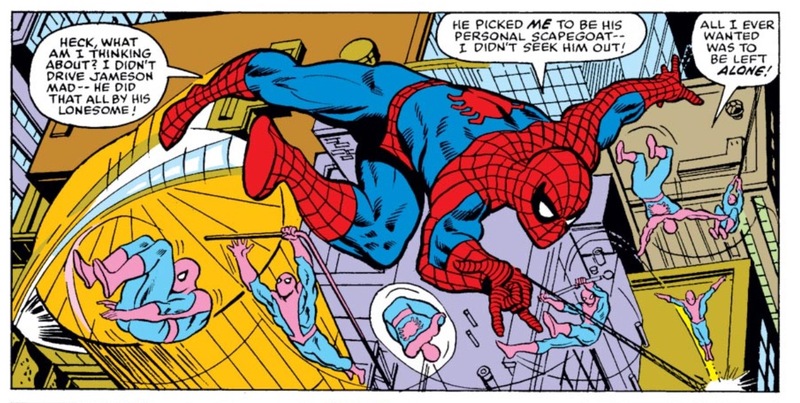 That’s why after finally completing my Amazing Spider-Man collection in October 2014, I started to contemplate my great escape. I started writing over at SuperiorSpiderTalk “full time” in June 2015, and Chasing Amazing was eventually rendered moot, and inactive. But now I’m getting itchy again. A lot has happened in my life since I stopped regularly posting over here. Some of it good, some of it not so good. I recently realized that my little “Remembrance of Comics Past” posts — aka, my little Proustian “madeleines” — were a form of therapy for me. While my journey to collect every issue of ASM has effectively ended, my relationship to both my collection and Spider-Man continues to evolve (thanks, in large part to all those good and bad things that have happened in my life recently). And I like to get back to exploring that again. Is the timing of me getting back into the game a little suspicious to you? OK, fine you got me, I also have a book coming out in June, 100 Things Spider-Man Fans Should Know & Do Before They Die. It’s being published by Triumph books and can be preordered anywhere where books are sold (like Amazon, Barnes and Noble and IndieBound to name a few). But seriously, I really do want to get back to using these comics and my favorite superhero as a launching pad to see where my brain and memories take me. So without further ado, after years of making you wait, let’s kick things off with my post about Amazing Spider-Man #201 by Marv Wolfman and Keith Pollard. I’ve mentioned a number of times in the past that my interest in collecting comic books was actually born out of my very first collection: baseball cards. So it should come as no surprise that in addition to scouring the spinner rack every month for new Spider-Man comics at my local corner candy store/newsstand, I also purchased a number of issues at my local baseball card/memorabilia shop — specifically comics that were considered “collectible” (which, from my pre-teen perspective where any issues found behind a counter or hanging on a special wall display that were bagged and boarded for prosperity). Yes, at one point in my life, an early 80s issue of Amazing Spider-Man that didn’t feature any notable first appearances or creative team changeovers, was absolutely considered a collectible. Regarding ASM #201, I walked into that baseball card shop one day and was instantly captivated by this “old” Spider-Man comic hanging on the wall like it was some kind of lost relic. Heck, the original cover price for this comic was 40 cents. 40 cents!! Do you know how old a comic must be to be worth 40 cents (says the guy who bought this comic at a time when the going rate for a new issue was probably $1.25)? Could you honestly blame me for staring longingly at the wall display of comics at Doubleheader baseball cards and then desperately trying to cobble the $20 or so that I needed to make this purchase that was going to change my life forever? I can guarantee you that immediately after I made that purchase, I grabbed my last copy of the Wizard Price Guide and saw that a Near Mint copy of this comic was worth more than double of what I paid for it. Who cares that there is not a single collector or evaluator alive who would consider my copy of ASM #201 “Near Mint” or anything remotely approaching that grade (and that’s even when you disregard the very pronounced tear/crease on the bottom right hand of the issue — which I’m going to rant about shortly). Of course, one of the big draws for me buying this comic, especially in the early 90s, was that beautiful cover (courtesy of the great “Jazzy” John Romita) featured the man, the myth, the legend, Frank Castle, aka the Punisher. It’s funny, because, thanks to the Netflix’s Daredevil series (and his own forthcoming solo series), the Punisher is a bit of a household name again. But for the longest time, outside of a couple of truly excellent storylines (like the Garth Ennis/Steve Dillon Punisher Max books), the Punisher had come to represent all of the ugly excesses of the 90s comic book speculator boom. The guy was literally everywhere, showing up, guns a-blazing in somebody else’s series, or starring in about a half-dozen of his own solo books. I’ll be damned if I can recall reading and retaining the vital narrative elements from a single Punisher story that were published or I purchased in the early 90s.If I did, I would have probably been turned off by the character, especially during the period where Punisher had evolved in someone who gleefully and violently murdered as many faceless goons as possible (one of my all-time favorite anecdotes from Sean Howe’s Marvel Comics: The Untold Story, remains the one where Marvel’s editors mandated if a new crook was introduced in a Punisher book, he needed to be killed within a few pages of first appearing). As I’ve revealed in numerous other forums, rampant violence involving uzis and bazookas isn’t really my cup of tea, even dating all the way back to my pre-adolescent days when I would rock out playing Hogan’s Alley with my NES light zapper like anybody’s business. 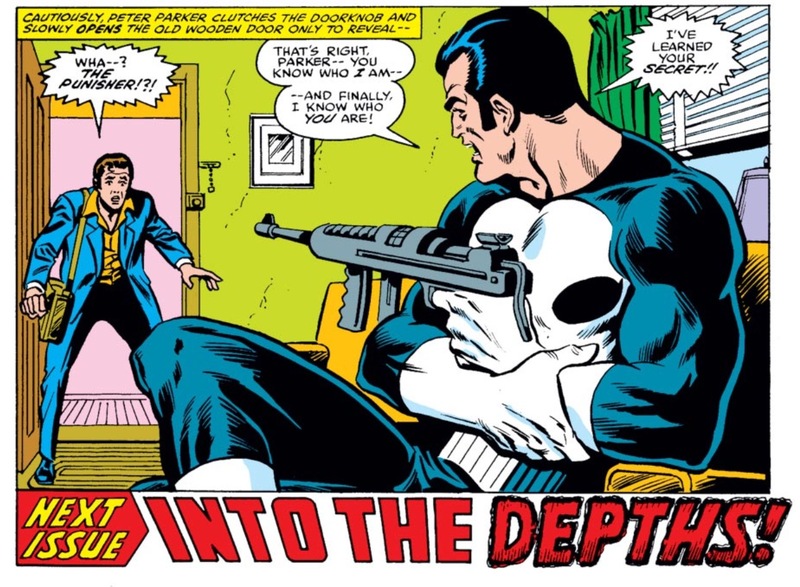 Still, I distinctly remember owning a ton of comics that had the Punisher’s name, his picture, or both on the cover, in large part because I thought the character just looked super cool. That design (which was notably refined by Romita, including the iconic “skull” emblazoned black t-shirt, before Ross Andru got to draw Castle’s first full story in ASM #129) is absolutely legendary. And like I just said, the character was EVERYWHERE in the 90s, and it’s hard for a kid to not be seduced by the merry marvels of marketing. So, when I had an opportunity to get a somewhat “early” appearance of the Punisher in an issue of Amazing Spider-Man, I viewed it as the opportunity of a lifetime. As an added bonus, the point at which ASM #201 was published (February 1980) actually marked a fairly interesting period for the character. It was a few years after he was first introduced by Gerry Conway in Amazing Spider-Man #129 but about two years before Frank Miller would truly kickstart Punisher’s career as a nagging antagonist to Daredevil (thereby marking the second major character after the Kingpin who was first introduced in an issue of ASM that Miller transformed into a critical part of Matt Murdock’s universe). Spider-Man and Punisher had certainly tangoed a few times leading up to ASM #201, but in reading the issue in retrospect, there’s still this sense of caution and hesitancy in how Wolfman writes the character. There’s definitely an inherent understanding that there’s something unique and special about Castle, but Wolfman doesn’t fully connect to him in a way that Miller and others later would. That’s not a criticism of Wolfman mind you. But it’s amusing to me how in this comic specifically, Punisher is stalking Peter Parker for somehow finding a way to take photos of a mob shootout he and Spider-Man had broken up the night before, and even with all the evidence staring Castle straight in the eye about Peter’s connection to Spidey, he’s just not clever enough to draw that conclusion (disregarding how the ending of the comic fakes the reader out into believing that Castle has achieved just that). Miller’s Punisher probably would have figured that out. Of if he didn’t, there still would have been more menace and danger to the fact that he was tailin Peter. Y’know, I bought this copy off the stands as an early teen and it also has that crease. In the EXACT same spot. I always thought it was an imperfection caused while folding and trimming the signature down to make the comic and seeing yours I think I am right. I worked at a print shop later on and we printed magazines as eight page signatures and folded them down to then have them trimmed and bound. One machine did the folding, collating and saddle-stitching. Sometimes this same thing would happen, just in different areas of the cover. If everything is not perfect the book can have folds, tears or creases. Most are caught quickly and tossed but not always. We never printed up comics but I think the same problems we had could have occured there. This means, of course that it was there when you bought it but it was a bindery defect and not something done by an owner. Side note: my copy of issue #100 of ASM also has this. In the EXACT same place! That is interesting … didn’t even think of it as a binding/shipping imperfection. However, my copy of ASM #100 is nicer than my ASM #201. Must have bought it from the right guy! Glad this blog is back, Mark! Now I won’t have to just fondly reminisce about your fond reminiscings.